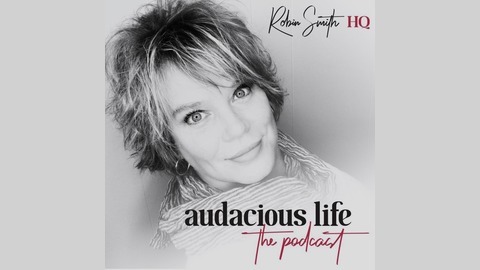 Audacious Life — The Podcast is badass! In each episode Robin the Disruptor Guru will teach and lead discussions about all things that help empower women to create the life they deserve and desire. 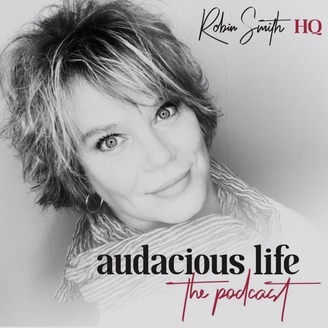 Through Robin's interviews with audacious women from all walks of life and all over the globe, and through her teachings of Audacious Life Formula 1.0, you too will become an audacious badass woman living an Audacious Life. So you might say she’s the adventurous type, growing up in Connecticut, going to college in Virginia, working for Disney Publishing in New York City, and heading west to Arizona where she met her future husband. After marriage, they moved to Denver, started a family, and finally settled where they are today in Fort Worth. Today she is a successful Rodan Fields rep.
Leslie had a lot to navigate as a young girl. Between the ages of 8 and 12, her father underwent a quadruple bypass after a massive heart attack and her mom had breast cancer and a radical mastectomy. One sister suffered a brain hemorrhage while away at college, having to relearn how to walk and talk, and her other sister was anorexic. But these experiences taught her to take an objective, positive perspective when confronted with issues that otherwise can be emotionally draining. It’s easy to get so caught up in the day that we forget to take action. You can allow yourself the time you need to dwell on a challenge, but at some point you must take action. Don’t get so caught up in the day-to-day routine that life passes you by and you end up with regrets. Write down what you really want, not what you think you should want. Take the time to remember what you accomplished yesterday and what you will accomplish today. Delegate. People want to help. Determine your hourly worth based on how much you want to make annually.